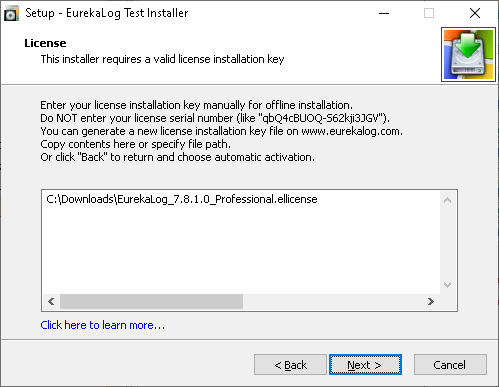 EurekaLog installer for non-free versions (e.g. a EurekaLog Professional or EurekaLog Enterprise) requires a valid license. 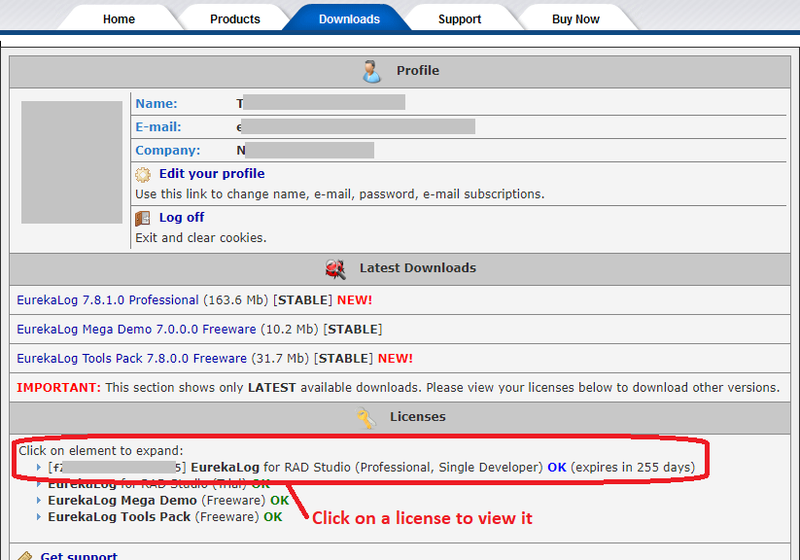 Freeware EurekaLog Tools and EurekaLog Trial do not require license for installation. The easiest way is obtaining license automatically: just enter your login credentials (e-mail / password pair) for our web-site and click "Next". These are the same credentials that you are using to log in to your control panel on our web-site. Installer will connect to our web-site and automatically obtain a new license key from a suitable license. You can continue with installation as usual. Of course, this option requires you to have a live internet connection during installation. Note: of course, you have to have a valid license for the currently running installer. Installer will tell you if it is unable to obtain a license key. If your PC does not have internet connection or if you can't or don't want to use automatic way - you can specify license manually. You can do this by downloading a license key from our web-site in your control panel. You have to find installer that you are going to run and use a corresponding "Get License File" link. This will start download for .ellicense file. License key file is an ANSI text file, which can be opened in any text editor, transferred between machines, etc. 1. Be sure to select the right installer. License keys are installer-specific. 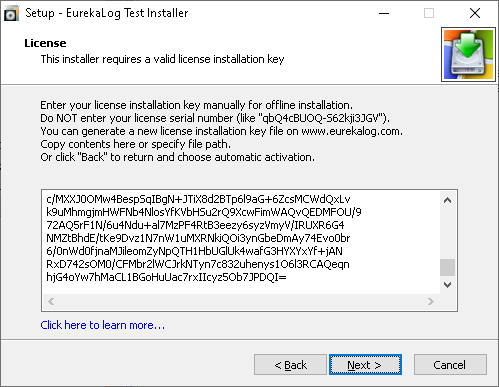 Installer will reject license key generated for the different installer. 2. License key is valid for a short amount of time (few days). 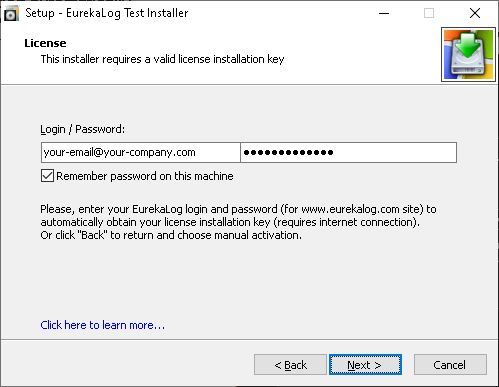 You can install EurekaLog on your machine, VM, etc. in a row. 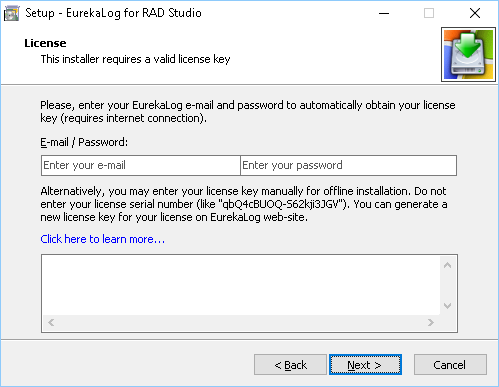 But if you want to re-install EurekaLog a week later - you would need a new license key. There is no limitation on generating license keys, so you can obtain a new license key whenever you want. 3. Do not enter your license's serial number - it will not work. • Open license key file in any text editor (like Notepad). Select all its content and copy it to clipboard. Run the installer - it will pick up license key from clipboard automatically. • Additionally, installer may re-use old license key left from previous installation. In this case, the license key will not be asked. After you have supplied license key to the installer via any of the methods above - the installer will let you to continue installation as usual.